The Best Things to Do in Cusco – The Discoveries Of. Cusco is a mandatory stop for anyone visiting Peru. The ancient capital of the Inca Empire is one of South America’s most fascinating destinations. Want to know what you shouldn’t miss during your time in Cusco? Here are some awesome things to do in Cusco for a cool trip. Cusco has archaeological discoveries galore, a buzzing nightlife and is the gateway to Machu Picchu. Put frankly, it’s a total must for anyone visiting Peru. I absolutely loved Cusco but I’ll be the first to admit that before I arrived, I was a bit clueless about just how many places there were to visit in Cusco. In fact, it took me several weeks to discover all of Cusco’s attractions. 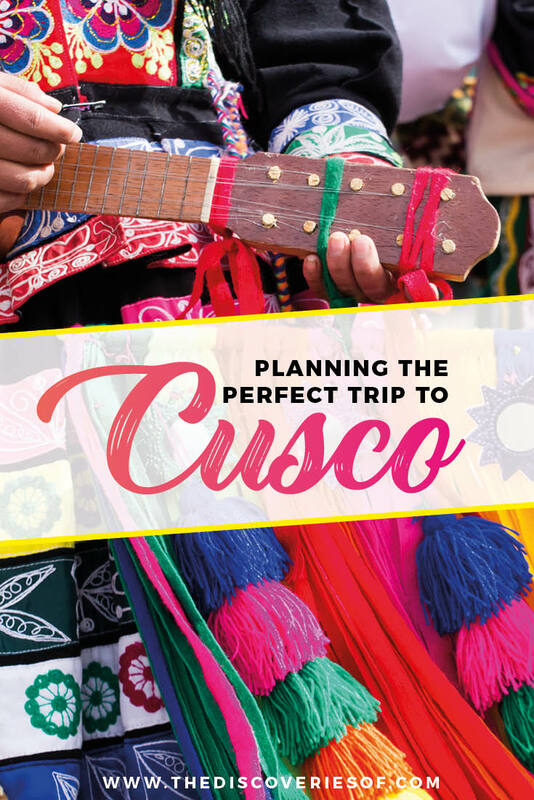 Don’t make the same mistake: check out this guide to the best things to do in Cusco. Looking for more South America travel tips? Check out these handy guides. Perched at an altitude of 3,400 metres, there’s a pretty good guarantee that Cusco will make your head spin, literally. But there’s more to this city than dizzy heights. In Incan times Cusco was the place people went to enjoy themselves (and the Incas definitely knew how to party – coca leaves and guinea pig anyone?). Filled with history, it’s one of Peru’s most important Inca sites (alongside Machu Picchu), the ancient head of an empire that spread across nearly half of South America. In short – it’s a must-see spot in Peru. 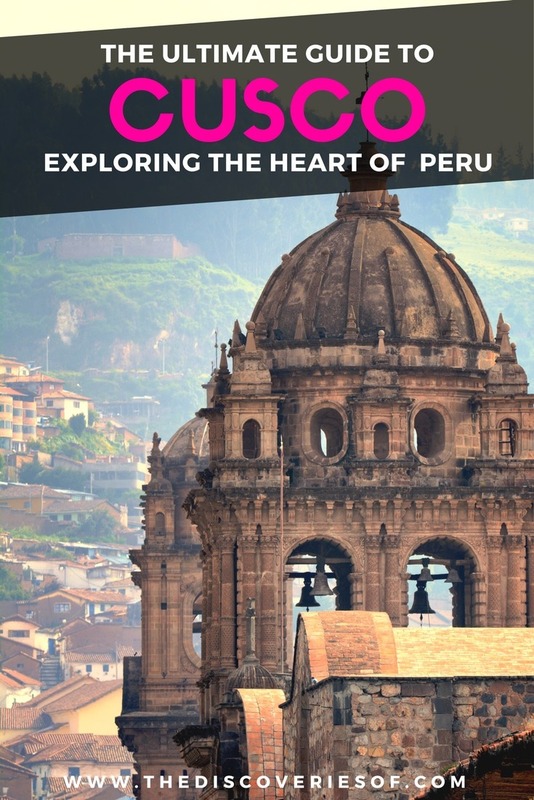 Today, Cusco is one of Peru’s most exciting destinations, filled with backpackers, well-heeled tourists and some of the friendliest locals you’ll find in South America. South America’s oldest continuously inhabited city has a wealth of historical sites that will fill even the most ambitious of itineraries. It’s no wonder that many people come to Cusco for a two-day trip and end up staying a lot longer (yeah, that’s exactly what happened to me). Cusco’s gorgeous spacious plazas, well-maintained Inca walls and narrow cobbled streets are a welcome change from the sandpits and congested roads of most cities. If you’re looking for things to do in Cusco, you’d do well to start with the Plaza de Armas. 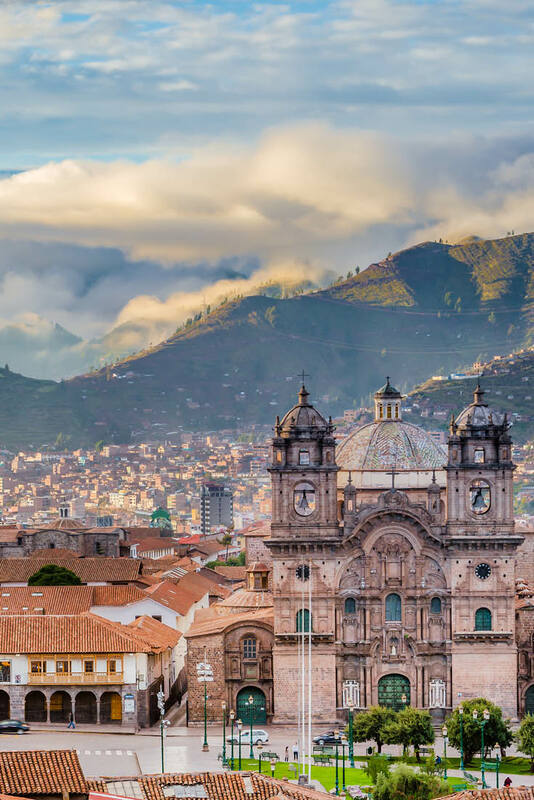 Like many South American plazas, Plaza de Armas has a couple of important landmarks on it (including Cusco’s Cathedral, listed below), but much of its appeal is down to the fact that it’s the thriving heart of the city. The large plaza was built by the Spanish on an impressive scale. Well-tended gardens and wide walkways add to the sense of grandeur. Interestingly, the Spanish built much of the Plaza we see today in the same location as the Inca square – which was twice as big. Although most of the Inca architecture was destroyed, you can still find traces of it here and there if you look hard enough. 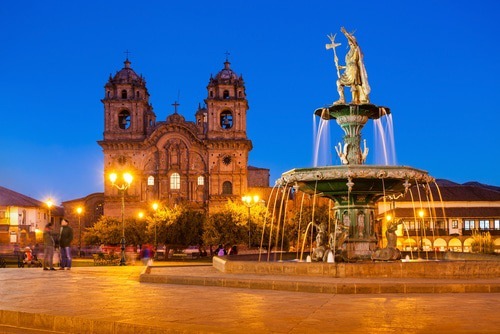 The eye-catching Cusco Cathedral on the Plaza de Armas is the largest in South America. There’s no way that you can miss this Cusco attraction, which towers over the plaza. Conquering Spaniards built the cathedral, starting construction in 1559. Although the cathedral is unquestionably Spanish in style, there are significant nods to the city’s Inca heritage too. Perhaps not too surprising as the cathedral is partially built with stones stolen from the ancient Inca site of Sacsayhuaman. Don’t be surprised to see the Inca Pachamama (Mother Earth) side by side iconic imagery of the Virgin Mary. Some might say that the interior comes close to being a tad overdone, but is definitely worth seeing. One thing’s for sure – no-one’s going to accuse the designers of being stingy on the gold front. If there’s one thing you need to know about Cusco, it’s that there are a lot of religious buildings. 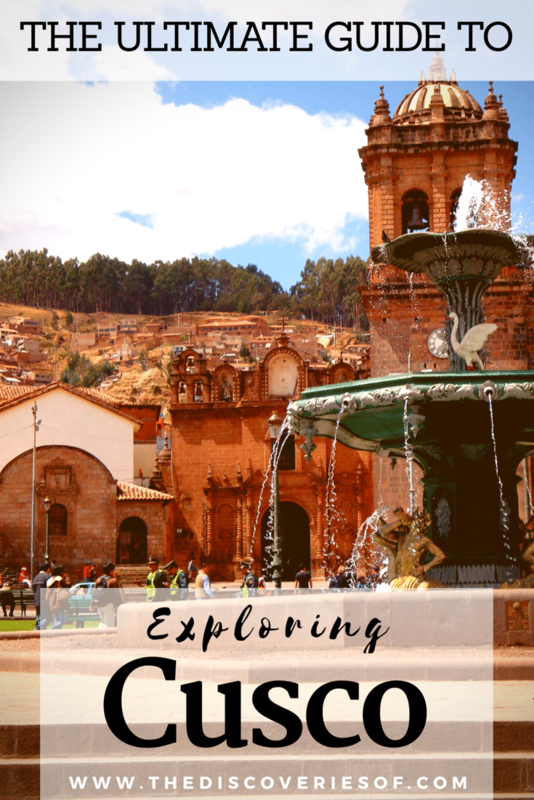 I’ve tried to go light on the churches in this list of places to visit in Cusco Peru, but there are some that are too good to miss. The Iglesia de la Compania de Jesus is one such church. Located bang next to Cusco Cathedral, the Iglesia is an exuberant exercise in baroque architecture. It was built by the Jesuits to rival (and ultimately outshine) the Cathedral. The Cathedral’s then archbishop was so put out by the move that he complained to the POPE that it shouldn’t be allowed. The Pope agreed – unfortunately by the time that the decree reached Cusco, the Iglesia de la Compania de Jesus was almost finished and there wasn’t really anything anyone could do. Who’d have thought Christian rivalry would be so fierce? Deciding which church is the ultimate winner in your eyes is undoubtedly a must do in Cusco. Head one block north of the Plaza de Armas you’ll find the quaint but rather outdated Museo Inka. The Museo Inka also known as the Admiral’s House as it was first owned by Admiral Francisco Aldrete Maldonado. It’s survived two major earthquakes in 1650 and 1950. Thanks to some intensive restoration, has regained its position as one of the city’s finest examples of colonial architecture. Sure, it’s got nothing on some modern museums, but I rather liked my visit to the Museo Inka. It crops up in pretty much every piece things to see in Cusco for good reason. The museum offers visitors a chance to learn about the Inca empire (pretty much a must if you’re spending time in this part of Peru) and is housed in pretty spectacular buildings too. So what can you expect to see? The ghoulish skulls of those who underwent brain surgery before the days of anaesthetic might not be to everyone’s taste. If not, there are rooms and rooms filled with Inca artifacts and a courtyard dedicated to showcasing the traditional weaving skills of the local women. The ruins in Cusco are some of the best to be found in Peru. If you only have time to visit one or two, then make the Qoricancha your first stop – it’s definitely one of the best places to visit in Cusco and should be at the top of your Cusco itinerary. Why’s it so special? Well, to be frank, it’s a bizarre amalgamation of Spanish Colonial meets Inca temple. The result is totally unique. Originally, Koricancha had six major structures, sanctuary temples to venerate the Sun, Moon, Stars, Lightning and Rainbows, as well as a residence for its priests. Qoricancha translates as The House of the Sun and was the Incas’ most important temple and a sacred site. It would have been decorated with gold sheets as a testament to its importance. Unsurprisingly, the temple was ransacked by the Spanish who then built the church and convent on the site instead. Much of Qoricancha’s Inca architecture has been uncovered. The contrast between the stately Inca constructions and the elaborate decorations of the later monastery is striking. In fact, you can still see the imposing walls of the original structure within the church. Equally impressive, but a little out of town is the exquisitely built site of Sacsayhuaman. A significant part of the original structure was used as building materials by the Spaniards, but what remains gives a glimpse at how large the fortress once was. The vast stone blocks were so well crafted that even after such a long period of time, they fit together without the need of mortar. Theorists believe that the site was originally a temple to the sun and its capture by the Spanish marked the death knoll of the Incas. Even so, it still manages to attract thousands of pilgrims each year who come to celebrate Inti Raymi, the festival of the sun. There’s much to see in these ruins, from the giant zigzagging stone walls (legend has it they formed the teeth of the puma-shaped Incan empire that is now Cusco) to the carved stone benches that form the what historians and architects believe was the Incan throne. The admission ticket to visit Sacsayhuaman is included in the Boleto Turístico, a tourist ticket that includes access to 15 other Cusco attractions for 130 sol (£30). Just a few minutes away from Plaza de Armas, the San Pedro Market is the city’s busy hub. 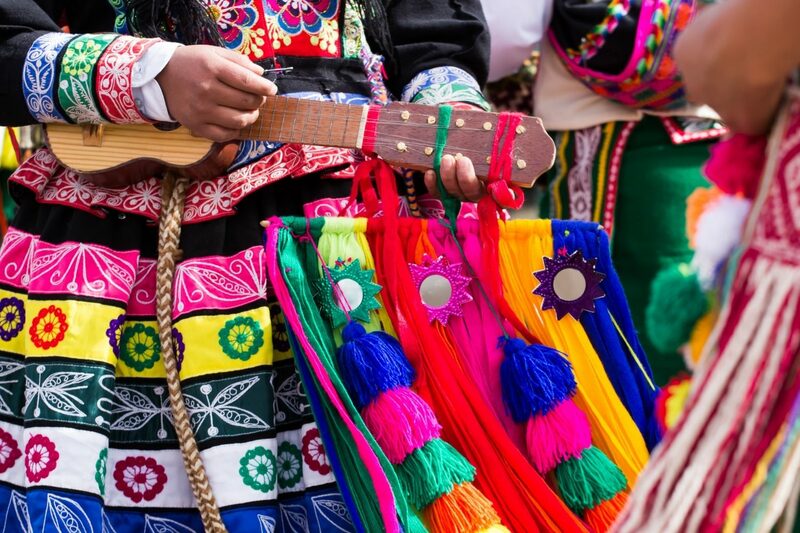 The market gets our vote as one of the best things to do in Cusco – plan to spend a morning or afternoon there. Explore every inch of the market from the raw meat stands to each of the 30 or so juice stands offering fresh squeezed juices from local fruits. Competition is high – sometimes it feels like success in the market is purely a matter of who shouts the loudest. It all adds to the slightly frenetic atmosphere. The market is a great place to get fresh ingredients, but also to pick up souvenirs for your family and friends. Shops sell anything from little knick-knacks like magnets and pens to novelty mementoes like pachamama dolls- handmade colourful dolls. All that wandering around in the heat takes a lot of energy. Refuel at the city’s best restaurant, the Inca Grill. Their mouth-wateringly good food is complemented by the unmissable people-watching opportunities provided by the restaurant’s location on the Plaza des Armas. Guinea pigs were originally raised specifically for eating before they became pets after the Spanish sent them back to Europe. Guinea pig meat is special in Peru because it’s higher in protein and lower in cholesterol than chicken, pork and beef. Even though you can find cuy at most restaurants in Cusco, the best place to eat cuy in Cusco is Kusikuy. This beautifully decorated family owned restaurant has made a name for themselves with cuy as their speciality. At the high end of the scale, Hotel Monasterio is built in a renovated 16th century monastery. The monastery in turn was built on the site of an Inca palace. It’s pricey, but entirely worth the extra spend. If you’re looking for a luxurious stay, but don’t want to completely break the bank, then Hotel Libertador Palacio del Inka is the place for you. On the other end of the scale, if you want somewhere that’s social and great for meeting people, The Point Hostel is a great choice. For those that feel like they’re past the dorm stage in their life, there are private rooms. The hammocks in the garden at the back of the hostel demand at least a few hours of stargazing (or dozing whilst pretending to read a book). The staff are also the go-to people for the lowdown on the city’s nightlife, guaranteeing there’s never a dull moment if you don’t want there to be. Have you been? What other things to do in Cusco would you recommend? Glad that you enjoyed the piece 🙂 Hope that you have a fabulous time in Cusco – I really did love it!